These stylish earphones make some genres of music shine. Others? Not so much. For over a decade, V-Moda has worked hard to carve a niche for itself in the oversaturated world of personal audio. Sharp angles abound in its audacious headphone and earphone designs. The build quality of its products could be compared to that of the personal audio gear churned out by its British rivals Bower & Wilkins: everything feels right; everything feels sturdy. When I think of its products, the word “misstep” isn’t one that comes readily to mind. Unfortunately, it feels like the right word to apply to V-Moda’s Forza Metallo wireless earphones, the company’s first attempt at a wireless in-ear audio product. While they offer a lot to like, these earbuds come with enough quirks that you may feel buyer’s remorse. As they’re made by V-Moda, we’re not surprised that the Metallo—let’s call these earphones that, for the sake of brevity—is both unique and beautiful. The pair I received came in a gunmetal grey color scheme, but they’re available in white as well. 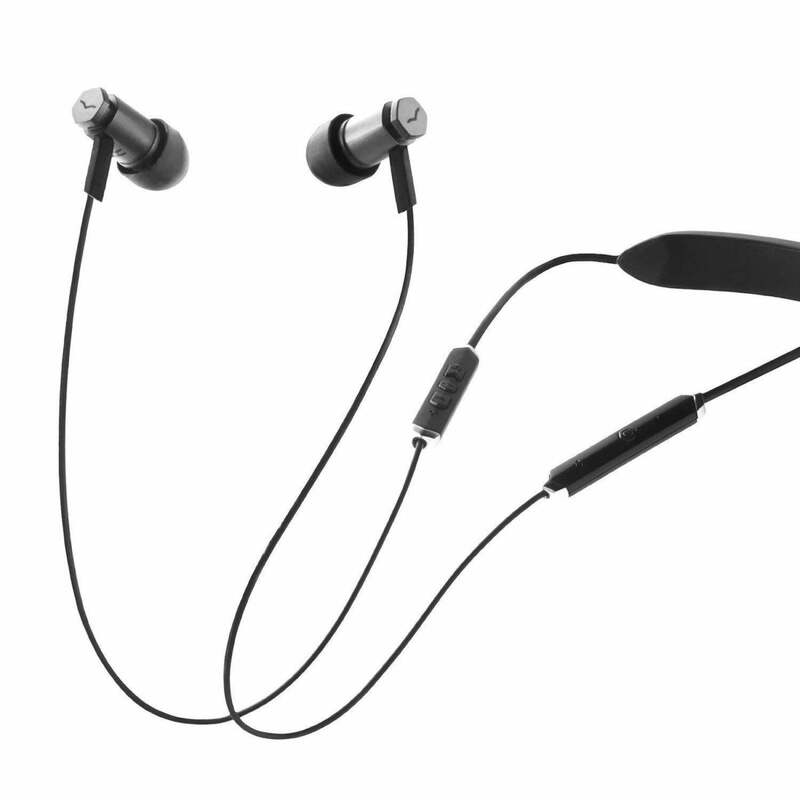 Like Bose’s QuietControl 30 or Sennheiser’s CX 7.00BT, the Metallo sports a neckband design. However, while the neckbands of these competing earphones are composed of a semi-rigid plastic loop, V-Moda opted for a more elegant option. The battery, Micro-USB charging port, Bluetooth radios, and other electronics that allow the Metallo to be powered up and communicate with your audio source—these are all housed in a lightweight plastic pod that’s shaped to sit comfortably on the back of your neck. V-Moda ships the Forza Metallo Wireless with a variety of accessories to ensure a good fit. Not only is it comfortable to wear, the neck pod also vibrates whenever someone attempts to call you. The “arms” of the Metallo’s neckband end in two short lengths of thick cable, each of which is capped with in-line controls. On the right, you’ll find the headset’s volume/track controls and a multi-function button. One the left: a power button. When not in use, the Metallo can be compacted down and stashed away. That’s something other neckband-style earphones can’t do, and I’d love to see more companies adopt this same approach in the future. Unfortunately, the genius of this design falters between the neckband and your ears. The cables that run from the inline controls to each earbud measure 10.5 inches in length, and this excessive wiring makes wearing the Metallo awkward to wear. I could hear the cables bounce as I walked around and I could feel them banging against my neck and shoulders with every step. Had a shorter length or heavier gauge of cable been used, these microphonics might have been avoidable. As the majority of the Metallo’s electronics are contained within its neckband, V-Moda was able to keep the headset’s earbuds small. By using a metal alloy in the construction of their end caps, the Metallo’s designers were able to provide the earbuds with some weight despite their compact size. This combination of compact dimensions and a little heft grants these earphones a degree of luxury they’d otherwise lack. 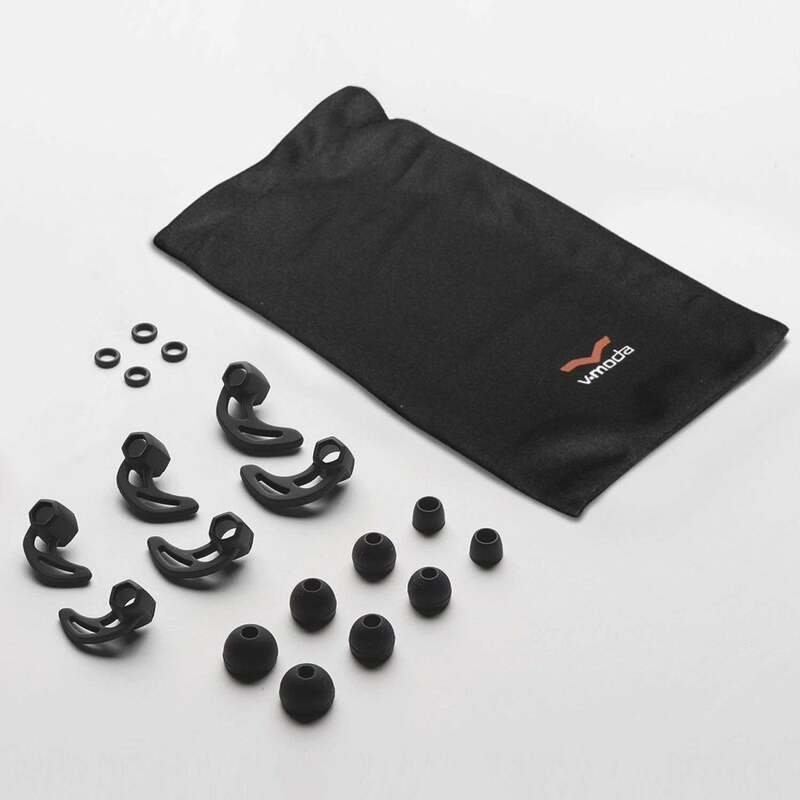 I manage to achieve a secure fit with the wide variety of silicone wings and ear caps that come with the Metallo, but fashion-conscious buyers will be pleased to know you can customize it with 3D-printed end caps available via V-Moda's website. Unfortunately, none of the available silicone tips provided a reasonable level of passive noise cancellation. While listening at all but the highest volumes, I was still able to hear my surroundings. V-Moda claims that the Metallo passed “sweat and weather” testing, but I have no idea what this means. Can you wear them in a downpour? Should you take them off before entering a sauna or having a shower? As V-Moda provided no IPX rating for these earphones, users would do well to exercise caution while wearing them around liquids of any kind. 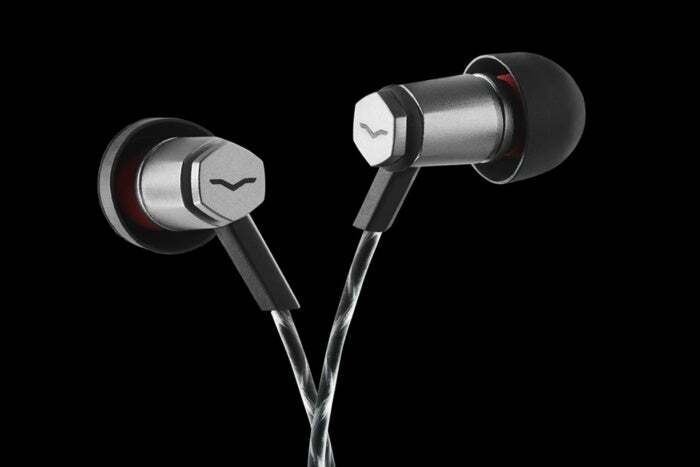 V-Moda claims that the earphones can provide up to 10 hours of runtime before they need to be charged. Over a week of testing, I found this estimate to be accurate. As for connectivity, you won’t find any problems here. During testing, I found the Metallo’s Bluetooth connection to be rock solid up to 10 feet away from my audio source. Provided your smartphone or tablet support it—iOS devices need not apply—these headphones also support Qualcomm’s aptX codec. Some earphones that sound great no matter what you’re listening to. These aren’t those. That said, for certain types of music, the audio that the Metallo serves up is absolutely outstanding. That said, the Metallo’s ample bass often trampled over the vocal work in many of the tracks I listened to. It also proved a problem while listening to acoustic music. I’ve enjoyed “Carboni’s Farewell” by Shooglenifty for years. It’s a piece I know well. While listening to it with the Metallo, I found that much of the nuance of the band’s slowly building performance was lost. The high voice of the band’s mandolin, banjo and fiddle seemed deeper than usual, leaving me feeling like I was listening to a bootlegged alternate take. My experience was similar while listening to music by The Bothy Band, Shakey Graves, and David Bowie: a whole lotta bass at the cost of everything else. If you listen to hip hop, ambient, or dance music, you may well love these earphones. For everyone else, their sound may fall short. No matter your taste in music, you’ll be happy with the audio quality of phone calls and FaceTime chats while using these headphones. I had no trouble understanding people I spoke with, and the parties on the other end of the line had no trouble understanding me. The V-Moda Forza Metallo wireless earphones boast an ingenious design and are comfortable to wear for hours at a time, both in and out of your ears. However, the heavy amount of bass these earbuds serve up might not agree with all listeners.